If you are looking for a way to show the special people in your life exactly how much they mean to you, why not have a go at making some tailor-made gifts for them. 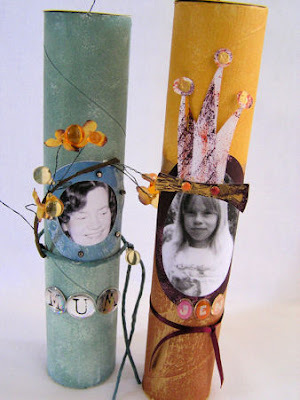 You can transform a cardboard tube into a beautiful gift tube simply by painting it, attaching a photograph of the intended recipient and finally, filling your tube with some of his or her favourite things. What’s more it is a fun activity to do, requires little financial outlay and a gift tube makes an ideal present for a variety of celebrations including birthdays, mother’s day, father’s day, and the seasonal holidays. Gifts – small, inexpensive items such as sweets, handkerchiefs, pencils etc that will fit inside your tube or paper/fabric that can rolled up into a scroll. Paint the outside of a cardboard tube. Be frugal – you can mix any colour from the three primaries red, yellow and blue. Add white to a colour if you want a pastel shade. Let dry. Use a small piece of dry sponge to dab on more paint to give a textured effect. Leave to dry thoroughly. Measure the diameter of your cardboard tube and divide this measurement in half to find the radius. Set the distance between the compass point and the pencil to the radius measurement. Draw two circles on card – these will be the lids for the top and bottom of the gift tube. Paint both card circles to match the colour palette chosen in step 1. Cut out two circles of sponge to the same measurement as the top and bottom lids in step 2. Push one of the sponge circles into the cardboard tube to seal one end of it. Glue one of the card circles to the tube at this end to cover the sponge. Use peel-off letters to spell out the first name of your friend or relative on your gift tube. Fill your tube with gifts. The list of gift ideas is endless, some examples include: For a father who is an avid reader write a verse from his favourite poem on the back of a bookmark. Add a needle, a few yarns and a cross-stitch pattern for a mum or grandma who enjoys needlecraft. A puzzle fanatic brother would love some crossword pages torn out from a newspaper or magazine, along with a brightly coloured pencil. For a child, homemade sweets are ideal, whereas a teenager may prefer beads to make jewelry. A great idea too, would be to let kids make gift tubes – a hand-printed handkerchief makes a lovely keepsake gift for grandparents. To seal the open end of the tube, push in a sponge circle and glue the remaining card lid in place to finish. Your gift tube is now ready to bring some joy to others. Copyright © 2009 by Anne Davies. All rights reserved.